In this help topic we will cover the fundamental concepts and building blocks of a Radzen application. When you start Radzen for the first time you will see the My Applications screen. Initially it displays a single sample application called Sample CRUD App. You can create new applications from this screen or import existing ones. Radzen Community users can have only one application (excluding the Sample CRUD App) at a time. Pages represent application scenarios such as displaying a list of data items, capturing user input via forms, visualising data etc. Create a new page via the New page wizard. Scaffold a data source (available in Radzen Professional and Enterprise editions). To create a new page via the wizard click the Create new Page button. The New page wizard will display and you can pick one of the predefined templates. Scaffolding is available in Radzen Professional and Enterprise when you create a new MSSQL, MySQL, Oracle, PostgreSQL or OData data source. Check the Generate pages for CRUD operations checkbox. Radzen will then automatically create CRUD pages for all selected tables and views (editing is supported only for tables that have a primary key constraint). For further details check the Create pages from data section: MSSQL, MySQL, PostgreSQL, Oracle. Page properties are “slots” for data. They can store various things: the response from a database query, data entered by the application user or something that the application developer has specified. The Properties article covers a lot of common property usages. 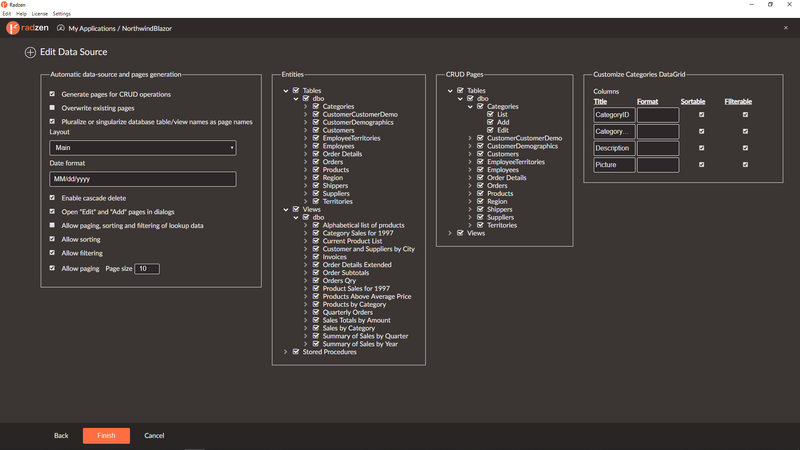 Pages rely on components to implement the application scenarios. For example a list of data items is usually displayed by a DataGrid component, the Form component captures user input. The various chart components visualize data. The Components article has all the info you may need. Those represent your data - either a database (MSSQL, MySQL, Oracle or PostgreSQL) or a service (OData, REST or Swagger). To add a new data source click the data button in the top right corner of Radzen and fill in the details. To add a database as a Radzen data source you have to enable server-side support. After adding a data source you can create CRUD pages from it or use it in existing pages to retrieve data and display it via components. To work with a data source use Invoke data source method. Those are special kind of pages that define the common look and feel of the entire application. A layout consists of components that are shared between multiple pages - header, footer, navigation, sidebar, logo et. al. 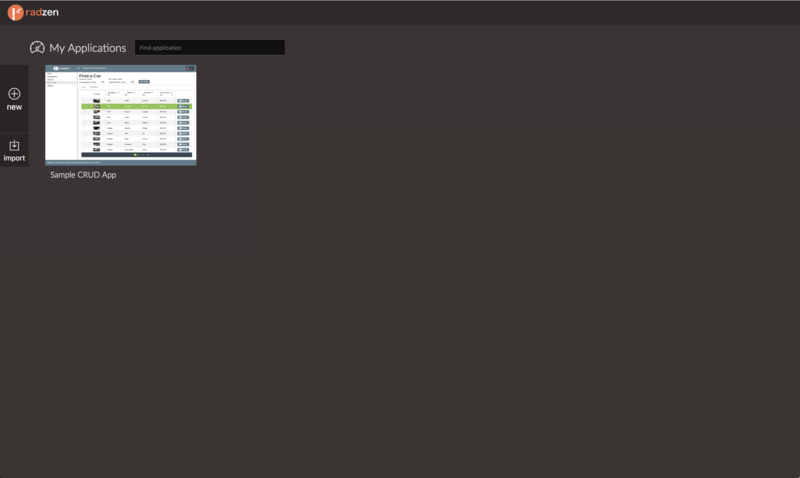 Radzen applications have one predefined layout called Main and all pages use it. If you later enable Security a second Login layout is added. This layout is used by the Login page.